The biggest investment by PPC Insulators in production process equipment of the last year is definitely a new shuttle kiln, designed and produced by a renowned manufacturer of firing systems Grün from the Czech Republic. We talked to Mario Rüster, General Manager at Grün and he presented the most important aspects of the new technological addition to the PPC Čab plant in Slovakia. „New and more efficient advanced firing equipment for top-quality results“ is how Mr Ruester described the new kiln built in PPC Čab, Slovakia. The following transcript is a short interview between Mario Rüster, General Manager at Grün and Nataša Skuk, Marketing Communications Manager at PPC Insulators. NS: PPC Čab has brand new shuttle kiln. 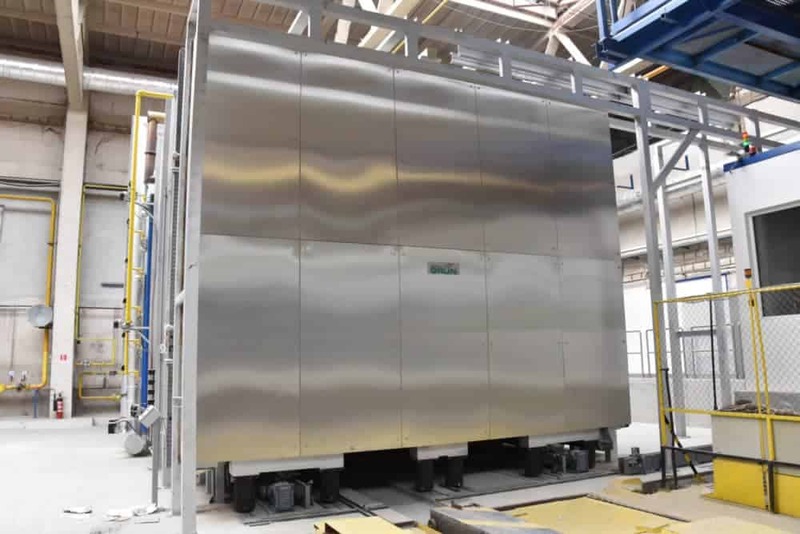 Designed and manufactured specifically for the production of ceramic fiber insulating blocks, the new Grün shuttle kiln is the most advanced of its kind on the market. What makes the leading kiln machine? MR: The new Grün kiln is a shuttle kiln built from materials of the highest quality, is a new and more efficient advanced firing equipment for top temperature uniformity through the whole firing and top-quality firing results. NS: Control and operation of the temperature are crucial for the production of high-density technical ceramics. How does Grün shuttle kill installed in PPC Čab ensures in terms of temperature control? MR: The regulation of temperature in Grün shuttle kiln is ensured through the use of a large number of thermocouples, which are connected via Siemens regulation with servo motors which regulate cooling and burners output. NS: Grün’s slogan is Go Green. How does it translate to the technology of the shuttle kiln at PPC Čab, as the kilns are running at very high temperatures for prolonged periods of time? MR: Energy saving is one of the key objectives of the technology that Grün is producing. High energy saving of Grün shuttle kiln is possible due to the use of multiple systems, such as heat exchanger for preheated kiln air, a heat exchanger for the dryer and a large number of regulation groups. The heat recovery system is ensured by a three-level exchanger (air/air), whereby the air entering the burner heads is preheated thanks to the combustion air. NS: Although you are capable of producing extremely big and voluminous kilns, shuttle kiln designed and manufactured for PPC Čab is technologically demanding. MR: Yes, the demands for producing for PPC Cab were extreme, however, we have prior experiences with building the insulator kilns, so we have succeeded meeting all the demands. Nevertheless, the kiln produced for PPC Čab is our biggest shuttle kiln ever produced, and that is why we are especially proud of it. Prior the kiln commissioning, the responsible staff of PPC Čab were trained to know all the functions of Grün shuttle kiln. By keeping of all regulations and also by the automatic regulation is the production fully reliable and safe. NS: Fully digitalized, new Čab shuttle kiln runs on Grün’s in-house developed process control system? What are the main features and advantages of this system? MR: The use of the shuttle kiln is fully automatized using Siemens S7 control system. The main advantage is the ease of use, a great possibility of kiln setting according to the customer demands and distance access for kiln operation. By keeping of the standards and regulations for using of gas Grün shuttle kiln and also considering the used materials, the Grün shuttle kiln is able to produce in the highest possible quality for over many, many years. Additionally to the new shuttle kiln, PPC Čab employed other measures for energy-conscious consumption including changing the lights, windows and filtration systems throughout the production area that will reduce the consumption of energy for nearly 100,000 kWh on a yearly basis.